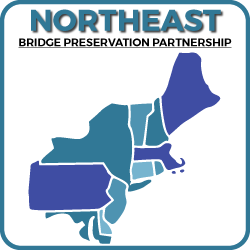 In less than two months, on September 11-13, the Northeast Bridge Preservation Partnership (NEBPP) meeting is scheduled to take place in New Brunswick, NJ. The meeting encompasses four sessions: deck preservation, research needs, case studies and retaining systems. Over 150 bridge preservation practitioners specialized in maintenance and repair of concrete and bridge structures will be gathering in New Brunswick from the States that comprise the North-East region: Connecticut, District of Columbia, Delaware, Massachusetts, Maryland, Maine, New Hampshire, New Jersey, New York, Pennsylvania, Rhode Island, and Vermont. In addition to representatives from the owners, the meeting will also bring together contractors, consulting engineers, academia and manufacturers, who can showcase their innovation in products and services. As with all TSP2 Bridge Preservation Partnership meetings, time will be dedicated to round tables where participants have the opportunity to exchange information and discuss practices that extends the service life of bridges. Through the free and open exchange of ideas and information, the NEBPP’s mission is to better serve those who use the northeast transportation system. NEBPP strives to use innovation, new ideas, new products, and the combined experience of participant States to make bridge maintenance procedures and repairs the best that can be provided.